Can Third Party Cookies Kill Your Sales? There’s no doubting that people have become far more conscious of their privacy online. It seems not a day goes by without some news story about how technology often infringes on privacy, and most people take more action these days to protect themselves. I assume Virgin Atlantic are sniffing out the Doubleclick Cookie, and because I’ve restricted 3rd party cookies, they seem to think I cant use their website. Of course this would be a reasonable response if I didn’t accept any cookies, but my browser should have no problems using their site to purchase my flight (I doubt the DoubleClick cookie is a show-stopper). 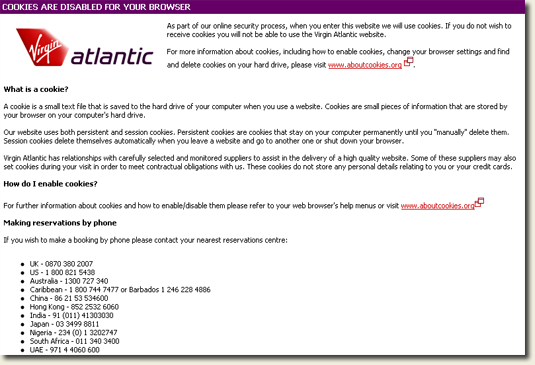 If virgin-atlantic.com checked their own cookies they’d see them alive and well, but right now they’re potential turning customers away, and I imagine losing valuable sales, all because of Doubleclick. No better way to kill sales and conversions than by blocking users from accessing your site. 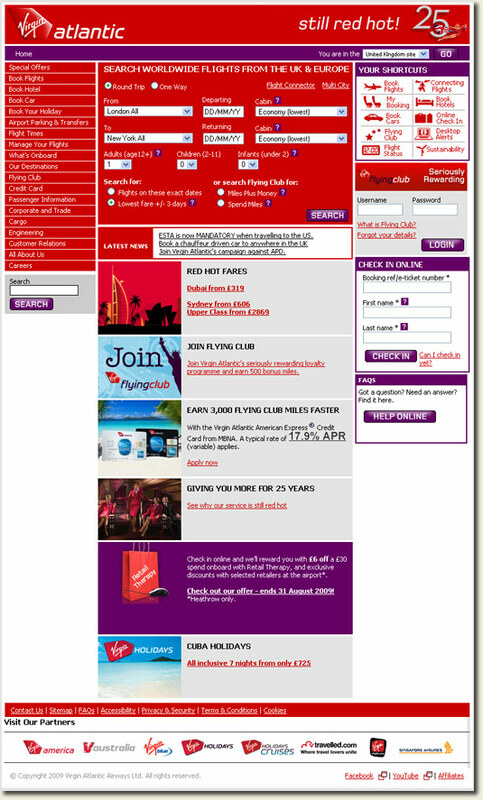 Hopefully Virgin-Atlantic.com will fix this ASAP. Thanks for dropping by, and I hope you don’t have too much hassle fixing this. I think you had cookies disabled in Chrome.i really couldn’t reproduce this. Seems either my problem was a fluke, or this has since been resolved. I’m quite sure my cookies were active when this happened, but I’m also unable to replicate now. I’d say that a user not having cookies allowed isn’t a good enough reason to put a huge barrier in front of them. Like you say, more and more people are disabling cookies so web developers need to be able to cater for them – not just put a huge sign up saying you can’t get past until you change something. well i think that barier it’s a good thing for a website. try accesing some important sale website without cookies enabled.see what u get back. Richard, still tried to reproduce that. Couldn’t yet. Hi Richard – the comment is a bit late in coming – I hope you don’t mind. I actually have a question as to the blocking of third party cookies and Google analytics. 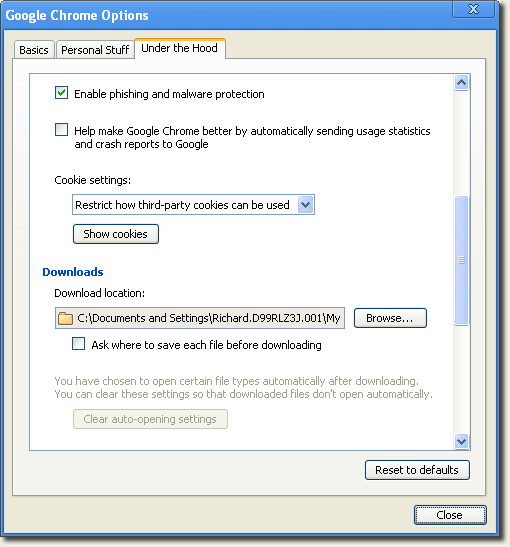 Are analytics cookies “third-party” cookies (I think so)? If so, what would you recommend as an option to block one’s own traffic to one’s own site (I currently use a filter with a cookie). 3. and then have third party cookies blocked at which point all existing will be kept? Also, would this result in people being logged as “unique visitors” each time they visit if 3rd Party cookies are being blocked by them? OK, a real mouthful – hope you don’t mind! Most analytics providers, including Google Analytics, use first-party cookies. The GA cookie belongs to your domain, so it’s first-party. I’m not 100% sure what it is you’re asking, but if I’m right then I think the way to remove your own traffic from GA is to use a filter. Blocking 3rd party cookies actually happens in the browser – you cant do anything as a site-owner/webmaster. The iframe idea wont associate the cookie with the site in the main frame, so I’m not sure if I’m following this last bit TBH? As to the analytics – makes sense. Thanks. Essentially, an iframe is simply another window, isn’t it – as if it were a page on its own? Yep – AFAIK the iframe will be considered a separate window and domain, but I’m not familiar with tweetmeme, so that cookie may actually be first party. Would take some digging to find out TBH. I’d say that there are some security issues that preclude data being passed between the parent and iframe. Thanks Richard – you’re a star – much clearer to me now. I appreciate your time in answering these questions.